According to Amadeus (30 April 2015), RwandAir plans to resume Kamembe service from 10 June 2015. It was previously planned in July 2015. Modifications can happen at anytime. According to Amadeus and RwandAir (02 June 2015), RwandAir will resume service from 15 June 2015. The airline will operate 6 flights a week till 20th june, then flights will be operated daily. According to Amadeus (25 SEP 2014), RwandAir will suspend its domestic service to Kamembe, from 01 November 2014 to 31 March 2015, due to work at Kamembe Airport. WB601 : BUS spents the night at Kamembe. According to Amadeus (17 MAR2014), RwandAir has canceled planned service increase to Kamembe, from 30 March 2014. The airline will operate 9 flights a week. Current timetables until 30 March 2014, see the news published on 29 September 2013, on this page. 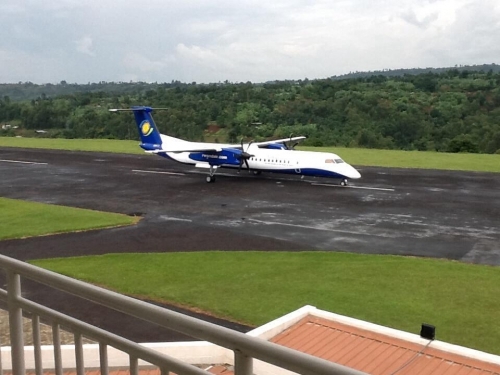 According to Amadeus (19 MAR2014), RwandAir will use its Dash 8 200 to Kamembe untel the end of works at the airport. According to Amadeus (29 JAN 2014), RwandAir will add more flights to Kamembe, from 30 March 2014. The airline will operate 13 flights a week. Furthermore according to Amadeus (13 MAR 2014), RwandAir will serve Kamembe with Dash 8 Q400NG. According to Amadeus (29 AUG 2013), RwandAir will reduce flights to Kamembe, from 23 September 2013. WB 661 / 662 will be deleted on monday (last flight on 16 September). The airline will operate one daily flight on monday and 10 flights a week. According to Amadeus (26 JUN 2013), RwandAir has just added flights to Kamembe. On Mondays and Fridays, there will be two flights instead of one flight. KME : Kamembe - KGL : Kigali . According to Amadeus (27 MAY 2013), RwandAir will reduce flights to Kamembe, from 01 JUN 2013, with new timetables. According to Amadeus (31 JAN 2013), RwandAir will reduce flights to Kamembe, from 06 JUNE 2013. Kamembe will be served 9 times a week, instead of 14 times a week.